I love making crustless, vegan quiches! They are so easy to make and so healthy! They also are a great variation to eating tofu and give you the wonderful benefits of nutritional yeast! Yeasts have long been used as supplements. While brewer's yeast is a by-product of making beer, nutritional yeast is made specifically for human consumption (1). It is a rich source of B-complex vitamins, trace minerals, and some protein (1)! Nutritional yeast has a cheese-like taste- sprinkle some on your popcorn, or substitute nutritional yeast for parmesan. However: nutritional yeast is not a good source of vitamin B12 (a vitamin of particular concern for vegans), unless it's been fortified with it (2)! You can find nutritional yeast in the bulk section of Whole Foods or the Harvest Co-Op. The first recipe I made was the Crustless Spinach and Mushroom Quiche from Happy Herbivore. You cannot compare vegan quiche to quiche made from real cheese, but I was happy with my first attempt at making a vegan quiche! 2. Add the first eight ingredients in a blender, and puree until smooth. 3. -If you already defrosted some frozen spinach, skip this step! -If you are using still frozen spinach: put the spinach in a bowl. Boil some water, and pour the boiled water over the spinach. Ta-da! The spinach is ready to use. It should be soft and not icy. A little ice is ok. Alternatively: steam the spinach, or add some water to a pot and cook the spinach until it's wilted. -If you are using fresh spinach: steam the spinach, or add some water to a pot and cook the spinach until it's wilted. -Note: feel free to substitute or add any veggies as you wish! 4. Drain and press the spinach to remove the extra water. 5. In a bowl, combine the tofu mixture with the spinach/vegetables. 7. Bake for 45-60 min. The quiche should be slightly crusty around the edges, and when you cut through the quiche it should be somewhat solid. Note: this quiche is light. It makes a good snack, or an accompaniment to a meal. I divided it into 5 servings, because each 14-oz package of firm tofu is about 5 servings, with 70 calories, 3 g total fat, 2 g carbohydrate, and 7 g protein each. For many months I have been DREAMING OF JUICING CELERY. (Weird, I know). But last week I finally got a juicer! Oh wow it was so worth it! I got the Breville BJE200XL juicer from Amazon and so far it has been performing wonderfully. Plus, clean up is not hard at all! Fruits and vegetables have numerous phytochemicals, which help prevent against disease! The complex vitamins and minerals that are in plants cannot be replicated or reproduced with nutrition supplements (Meyerowitz, 16). Juices come from whole foods, while nutritional supplements are anything but! Juicing can concentrate pounds of produce and their nutrients in just a few glasses! In one study, scientistists analyzed the antiviral activity of fresh apple juice to apple cider, apple wine, and apple juice from concentrate. The most antiviral activity was seen in the fresh apple juice. Why? Because pasteurization in commercial juices destroys protective enzymes, and thus, decreases antiviral activity (Murray, 9). So drink some fresh, raw, unpasteurized juice! If you have digestive problems, juicing could be your answer! Juicing has helped some people with weight loss. BUT- What about the lack of fiber?! The big juicing controversy. Juicing is not meant to replace eating. Eating has its own role, and so does juicing. (And I'm sure that supplementation has its own role, too). Salad in a glass! I actually used a third of the ginger that's in the picture, and the drink was a little strong on the kale. But it was still delicious and nutritious, and you can see a bit of orange foam on the top of the drink from the carrots! Carrots- great source of beta-carotenes (pre-vitamin A), contains B-vitamins & coenzyme Q10, good for dry skin problems, protects the respiratory system...(Meyerowitz, 313-314). They are also super sweet and great for juicing! Meyerowitz, Steve. Power Juices Super Drinks. New York, NY: Keningston Publishing Corp., 2000. Murray, Michael T. The Complete Book of Juicing. Rocklin, CA: Prima Publishing, 1992. OK, so here I will try to explain the factors that will affect the boiling time and the ingredients that you put into your masala chai! Apparently, the spices typically used to prepare masala chai are pepper, cinnamon, cloves, cardamom, and ginger (1). Partly why I didn't include any measurements is because I never use any, and I do everything according to taste. Two things to remember: there is no standard recipe for chai (everyone's recipe is unique). Additionally, any recipe you read is the author's best approximations. So when you prepare a recipe, you may have to add little more of this, and a little less of that. People also have different preferences, so don't be afraid to adjust recipes to your liking! Nut/seed milks- it's possible, delicious, and healthy! *I don't drink cow's milk that often. I usually use soy milk, and it turns out very well! 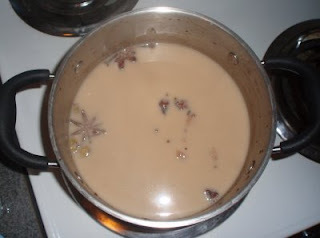 *I made masala chai for Slow Food BU's potluck last week (which unfortunately was cancelled due to the weather), and actually made the chai out of unsweetened almond milk because a friend was allergic to soy. I was really happy with the result- I put the spices in with approximately the same ratios that I do for soy milk, and the almond milk masala chai came out great! *Note- I tried making masala chai out of homemade sesame seed milk once, and it did not come out very well. When heated, the milk separated and was somewhat grainy. I do not know if this doesn't happen to the seed milks that are sold in stores, because they are typically homogenized/pasteurized. *If you decide to make masala chai out of regular cow's milk (the traditional way! ), the ratio of spices you put in will differ (different spices dilute out at different rates, and the rates will also vary according to the type of milk, because each milk has a different chemistry). You will also need to boil for a longer time and put in more spices, because the flavor of cow's milk is stronger than that of nut/seed milks. *It takes me quite awhile to get my chai made out of cow's milk to taste right. I'm so used to making masala chai out of soy milk, that making it out of cow's milk is a whole new game! You can make homemade masala chai in as little as 10-15 minutes. However, to make it this quickly, you will need to add more spices, in a little different ratios than if you slow-cooked it, and you might not be getting the most use out of your spices. See the section "save your spices!" below. I enjoy the process of boiling the tea for a long time (at least an hour). It's relaxing and makes me appreciate my chai even more! I also feel that it gives the masala chai more depth and complexity, and I get more use out of the spices this way. The newer and higher quality the spices are, the better flavor they will impart and the stronger their flavors will be (they will be more expensive, but will lead to less cooking time). Or if you have older or less quality spices, you will just have to boil longer or use more spices. Some places to buy spices: Whole Foods (check out their bulk section! ), the Harvest Co-Op in Cambridge and Jamaica Plain (bulk section! ), and Christina's Spice and Specialty Foods in Cambridge (even though it will be more expensive from here). Buying all of the spices for chai is expensive!!! Save your used spices in a container and put it in the fridge. Then whenever you're ready to make your next batch of chai (hopefully within a week or so- the spices might not last much more than that), you'll be prepared! You may need to add various amounts of different spices when you make your next batch, however. If you don't have the time or the spices- you can buy chai tea bags or tea mixes in stores. They typically have black tea leaves and some of the common spices added to it. Like any tea, you boil water, add the tea bag, and add milk and sugar as desired, and there you have it! Chai in less than 5 minutes! However, these tea bags or pre-sold mixes will typically be less complex and will not have the same depth and intensity of home-made masala chai! Someday I want to try making chai/spiced milk w/ rosehips. That will be fun! Sorry for cheating and not actually giving a real recipe here >.< ...but how to make masala chai is so personal and depends on so many factors and your own opinion! If there is enough demand for it, I may come up with a recipe someday. In the meantime, if you absolutely need a recipe to follow, here are some starting points: Culinary Teas - Masala Chai and chai-tea.org. When I WWOOFed at the farm Artisans de la Terre in Canada over the summer (I had an AMAZING experience by the way. WWOOF is a program in which you volunteer on a farm, in exchange for food and housing), I had the great opportunity of learning how to make masala chai from a fellow worker who had spent a couple of years in India. 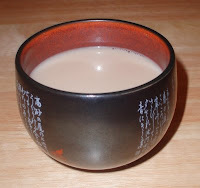 Chai is simply the word for tea in used in many cultures (1). However, in the U.S., the term chai generally refers to Indian masala chai, a tea made with a sweetner, milk, and spices (1). There is no one recipe for masala chai. Masala chai in India is like coffee in the U.S., is often sold in the streets or by street vendors known as chai wallahs in India, and Indian families each have their own unique way to prepare it (2). I put milk in a pot and add water to the dilution desired. I put in the following (from top to down and left to right as seen in the picture): black pepper, cinnamon, cloves, freshly ground nutmeg, star anise, ginger, a little sugar (usually, but not always, sucanut), black tea, green cardmom, and coriander seeds. Stir everything together, than cover the pot and bring it to a boil. -I usually taste the tea every now and then. I sometimes adjust the amount of spices, add a little milk, or add a little water, according to taste. I leave it on the stove until I like the taste. Ok, so that is the simplified version...and you may have noticed that I didn't put in any measurements or specific times. Um, and don't expect me to give you those, either. Sorry! Unfortunately, I am leaving it up to you to figure out these specifics (joy! ), which will differ depending on how you like your chai. Look for my advice tomorrow- when I will try to explain the different factors that will influence the amount of ingredients that you put in and the time that it takes for you to make masala chai! First, to recap part 1- personally, I was not a big fan of Life Time Life's Basic Plant Protein and Vega. They had a nice mix of proteins, but they also had "characteristic protein powder tastes," probably due to the addition of powdered vanilla and stevia. Living Harvest's hemp protein original flavor was the most natural, with only one ingredient: 100% certified organic hemp seed. However, it has a very strong and district greens/hemp flavor. (If you are interested, they also have vanilla and chocolate flavors sweetened with unrefined whole cane sugar). I would highly recommend PB2, but with only 5.65 g protein per 2 tbsp, it's mostly a low-fat peanut butter alternative rather than a protein supplement. And at $7 for a 6.5 oz jar, it is not a purchase that I will be repeating any time soon. For me, I guess there currently is no perfect vegan protein powder. Each has its pros and cons and is good in its own way. I think something that I forgot when I began this search was that protein powder is a supplement and not a whole food. I was trying to find a powder to count as a major source of my protein intake (apparently healthy adults optimally have around .8 g protein per kg of body weight per day*). However, I enjoy getting most of my nutrients through complete foods and not isolates, because a whole food is more than the sum of its parts. According to Nina Planck's Real Food, humans are "omnivores with bodies designed to eat plant and animal foods...[and] [t]here are no traditional vegan societies" (Planck, 21-22). Of course, everyone has their own opinion, and what works for one person may not work for another. While many people have successfully gone vegan, at the moment, a vegan diet is not for me. Remember, the right kind of diet is one that works for you, and there are many diets out there. However, I will try to keep animal products in my diet at a minimum for now. (Things can always change. And it's too bad I can't afford local meat from a farm like Stillman's more often!) In future posts, I hope to discuss veganism, vegetarianism, industrial meat, etc.! And as a last note, all is not lost in my vegan protein powder world! I will probably continue to incorporate vegan protein powder in my diet, but just in small and unnoticeable amounts (baking?!). Most likely, I will continue with hemp protein; but whenever I'm feeling up to it, I have heard some good things about NutriBiotic's rice protein. Their plain rice protein only has one ingredient, too! : "enzymatically processed rice protein from whole grain brown rice." *Brown, Judith E. Nutrition Throughout the Life Cycle. 3rd ed. Belmont, CA: Thomson Wadsworth, 2008. Because I have been trying to eat primarily vegan for the past couple of months without much success, I felt buying a good vegan protein powder was in order. To preface, I hate the taste of whey protein powders. My brother and I overdosed on vanilla and chocolate flavored whey powder in the past- the smoothies tasted great at first, but after 6 months-1 year, I couldn't handle it anymore! I also wanted to avoid a soy protein powder, because I already consume a lot of soy and don't want to develop an allergy/intolerance to it. So my protein powder search began with hemp from Living Harvest. Each 4 tbsp contains 120 calories, 3 g total fat, 10 g total carbohydrates, 9 g fiber, 13 g protein, 600 mg of omega-3's, and all of the essential amino acids! The only thing about hemp protein is that it has a very strong and characteristic greens taste. Via Elizabeth's recommendation, I tried the natural flavored and chocolate flavored protein powder by Vega next. It also has a nice combination of plant proteins, from hemp, yellow peas, brown rice, and flax. Each serving contains 26 g protein and 15 g fiber! Both powders had very "earthy" tastes to them, and I was not particularly fond of either. And even though Vega calls one of its powders "natural," vanilla flavor and stevia are still added. Last but not least, I tried PB2, which has been receiving a lot of buzz lately. Verdict- I actually liked it!! Each 2 tbsp serving has 53.2 calories, 1.87 g total fat, 3.4 g carbs, and 5.65 g protein. However, PB2 is used mostly as a low-fat alternative to peanut butter, rather than as a protein powder/supplement. You just add 1 part water to two parts PB2, stir, and presto! You have some low-fat peanut butter. And PB2 even looks and spreads somewhat like real peanut butter! Although PB2 can never truly replace real peanut butter in flavor and taste, it can be great when you're hiking, in baked goods, or if you are a peanut butter junkie. I would not recommend eating PB2 by itself, however. For full enjoyment, eat it with something- such in a PB&J sandwich or in a smoothie. PB2 is only sold in a few select locations or online. Look for my post tomorrow about my overall comments and thoughts on this protein powder adventure! Who Owns Your Food and Water Globally and Locally? Last Friday, Simmons hosted the 12th annual International Women's Day breakfast: Who Owns Your Food and Water Globally and Locally? The breakfast started off some amazing bread from Mamadou's Artisan Bakery in Winchester. One of IWD's slogan, Bread & Roses, calls for fair pay, decent working conditins, and respect. The phrase originated from a protest in Lawrence, MA, in which women's factory hours were reduced, but production increased and workers' salary was cut. In the U.S. and many other parts of the world, we are used to the idea of paying for water. However, Patricia Jones from the Unitarian Universalist Service Committee spoke about access to water as a human right. Nevertheless, here is a good sign: South African was the first constitution to incorporate water as a human right. Improving water sanitation is within our interests. Every dollar spent on water sanitation benefits the economy by $8! With the number of water shut-offs rising and increasing water scarcity due to global climate change, among other reasons, we need to learn more about our water. 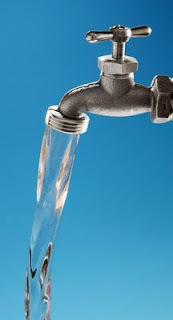 You can start from as little as paying more attention to your water bill, learning more about the Paul Simon Water for the Poor Act, or supporting grassroots organizations such as the UUSC. At the moment, the U.S. has no national water policy. What Patricia recommends: the U.S. needs a just and equitable national water policy with women involved, and which has a priority for the poor. Grey water, or water produced from domestic purposes such as dishwashing or doing laundry, can be filtered and cleaned and used for other purposes! World agriculture produces 17% more calories per person than 30 years ago. 982 million people live on <$1/day. 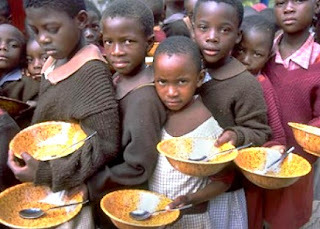 And unsurprisingly, around the same number of people, 963 million, suffer from hunger worldwide. In Sub-Saharan Africa, 1:3 people are chronically hungry. According to FAO, 33 countries are facing critical food shortages. Poor nutrition is the cause of more than 1/2 of all child deaths worldwide. Solutions include food and cash transfers (a project already undertaken in Malawi) and addressing chronic food insecurity through productive safety nets. Last but not least was the director of Natick Community Organic Farm Lynda Sinkins. Because we all eat, we are all part of the agriculture system. And because 85% of food is imported, and 15% is produced locally, we need to support and buy from our New England farmers so they do not run out of business. And with local CSA's, greenhouses, and urban agriculture, the ability to buy local produce and to do so year round is increasing every day! And if you would like to learn more about International Women's Day, look here! When I visited the Harvest Co-Op this week, Rice Dream Non-Dairy Frozen Desserts were on sale for $3/pint! I had never had it before, but via recommendation from a friend, I knew I needed to try it and decided to go for the strawberry flavor. The verdict: it was very good. I finished the pint in two days, and had to restrist myself in order to prevent finishing it in just one. 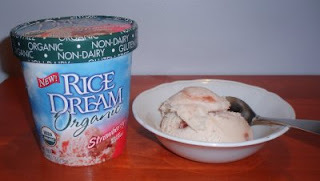 Although the taste is definitely non-dairy, I was very impressed by this rice ice cream! It was creamy, rice-like (Asians love their rice), smooth, not too sweet, and had just the right amount of strawberry flavor! Pros: It is sweetened only with unrefined sweeteners, including brown rice syrup, fruit sweeteners, and agave syrup. It has 0 g of cholesterol-raising saturated fat per 1/2 cup serving, compared to 8 g in Ben & Jerry's Dairy & Organic Strawberry Ice Cream! Cons: The price, and my (lack of) self control. Although Rice Dream's ice cream isn't the same as getting some fresh vegan ice cream from Wheeler's Café and Ice Cream Bar (which makes vegan ice cream from a soy and nut base, and which will be the topic for another post), it is highly recommended! I need to try their other flavors, which you can look at here. 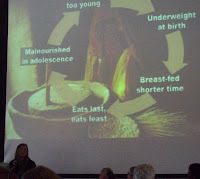 Last Friday, professor of Anthropology Ellen Messer spoke about Food and Security: Crisis, Challenges, and Choices. She addressed hunger, defined as access to nutritionally adequate food. Although enough food is produced worldwide to feed everyone a nutritionally adequate diet, there are the problems of access, unhealthy food choices, and underdeveloped community food organizations. One problem decreasing access to wholesome foods is high prices. High prices can result from decreased production (due to weather, politics, and warfare), increased demands for commodity crops and biofuels, a decreasing economy, and more. Because farmers see so little returns for their crops, many end up growing a combination of cash and specialty crops in order to have enough food to eat, while still making enough money to survive. More than half of the hungry live in 7 countries: Bangladesh, China, DRC, Ethiopia, India, Indonesia, and Pakistan. There are controversial solutions to these problems, including biotechnologies vs. agroecological/organic technologies, large-scale vs. small-scale farming, and free vs. fair trade. What the individual can do: You can become more a more informed consumer: suggested reads included What to Eat by Marion Nestle and Diet for a Small Planet by Frances Moore Lappé. Several international organizations involved with sustainable food systems worthy to look up are Oxfam International, Care, and Global Exchange. The next lecture in the gastronomy series: Henry Ford, Colonial Kitchens, and the Performance of National Identity by Abigail Carroll on March 27! And if you haven't checked out the Culinary Historians of Boston yet- they have a monthly speaker series always open to the public! Even though I have a whole other blog dedicated to this, I would feel bad not writing a post about the fermented tea kombucha that I brew here! Kombucha is a fermented and fizzy drink, said to have probiotic and detoxifying effects. When I drink it, I always feel great! Although the taste definitely takes some getting used to, once people get into drinking it they are usually hooked. I walked into the Harvest Co-Op in Cambridge yesterday, and was happy to see that in addition to their usual stock of GT's, Katalyst, and Wonder Drink Kombucha, there was a new brand: High Country! At $3.49 for 16 oz it is quite pricy, but because it was a new brand for me I couldn't resist trying just one. I ended up buying the Wild Root Kombucha to be adventerous- and it just tastes like root beer! Hight Country also has more traditional flavors like original, ginger, and Goji Berry, if root beer flavored kombucha isn't your thing. If you would like to read more about Kombucha look here. So I feel a little hypocritical about having my first food post on dessert- but who can live without it? When my family and I were in the South End, we knew we needed to stop by Flour Bakery + Café. With two locations, this bakery is now green certified at Washington St., with its Farnsworth St. location soon to follow suit. Flour has high quality desserts, with their sticky buns so popular that it's recommended to order them in advance! Or you can order them online- but there is a hefty $50-$70 overnight shipping fee. When we went inside I was pleasantly surprised to see that they had vegan muffins! However, my family opted for Flour's acclaimed oreo, which had two crunchy, chocolate cookies sandwiching a cloud of creamy filling. We also ordered a slice of Boston Cream Pie- the light cake was interspersed with layers of whipped cream and covered with a chocolate ganache, which had a slight but pleasant tinge of coffee. And the sugar was caramelized to perfection in the creamy crème brulée , providing a crunchy contrast to the soft and creamy custard. 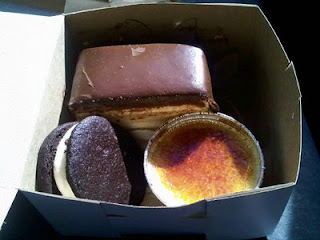 I will definitely be stopping by Flour Bakery again! I hear their cookies are amazing, and I need to give their sandwiches a try! Check out Flour's menu here. 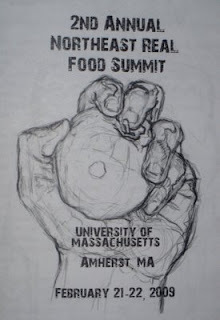 Last weekend several members of Slow Food BU and I visited UMass Amherst for the 2nd Annual NE Real Food Summit, where over 300 students from the northeast gathered to network, attend workshops, and brainstorm ideas on how to bring local, sustainable, fair, and real food into our schools. Real foods help to nourish the earth, producers, consumers, and communities. And with over $4 billion dollars spent on food every year by universities, colleges can make a significant impact on food supply trends. Thus, a goal of the Real Food Challenge, which runs the food summits, is to get 20% of all foods purchased by colleges and universities towards real foods by 2020. Ways that students can become involved in the movement towards more sustainable foods include joining the Youth Food Movement, creating or joining a Slow Food on Campus Convivia, joining the Real Food Challenge, or by holding an eat-in. 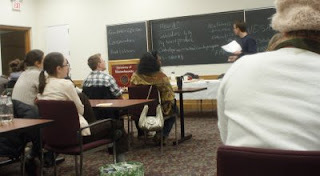 Workshops included "Building Food IQ and Sharpening Your Sound Bytes" by Dr. Susan Rubin, the founder of Better School Food. At this workshop, students learned, among other things, that the sweetener high-fructose corn commonly found in commercial foods has been indicated to be contaminated with mercury. Furthermore, it takes around 17 feet of sugar cane to make 1 cup of sugar. Suggested reads included The End of Food by Paul Roberts and Death by Supermarket by Nancy Deville. Meanwhile, in another workshop students discussed The Farm Bill and the Northeast with Simmons faculty member and NESAWG consultant Larry Dixon. Although improvements to the Farm Bill can always be made, students recognized some of its positives- including the fact that the farm bill sets aside money (over $2 billion for the next five years) for nutrition and food safety net programs. I will discuss food and food issues in later posts, but in the meantime here is a movie that I highly recommend: The Future of Food.